Born July 4, 1995. I became interested in Olympic weightlifting because of my dad. In 2010 I started working out at home using kettlebells. I started with a kettlebell program using 6kg. I then moved up to 12kg until I eventually was up to a 15kg program 6 days a week. Each time I exhausted a program; I’d call my dad for another. One day, he asked me if I would be interested in trying Olympic weightlifting. I thought “why not”. The next day I went down to my dad’s gym and started training. He saw that not only was I good at it, but I actually enjoyed it. In June 2011, Daddy took my sister Kia and I to the Toronto Supershow. It was amazing, I saw girls there who were competing in Olympic weightlifting. I wanted to be one of them. And so did Kia! Dad signed us up to train with Hani Kanama, coach of Kanama High Performance, that same day. But there was a catch, I had to have 3 months of training with him before I could make his weightlifting team. He accepted me after seeing my first series of lifts on the first day! After my “audition”, Hani told us that if I continued like this I could make the junior championships. And here I am. Canadian athlete from Toronto, Ontario, with a dream to compete as a female Olympic Weightlifter in the 2016 Olympic Summer Games in Brazil, I have been awarded best female weightlifter in Ontario pound for pound twice since having only begun lifting in 2011and has already broken 17 records, three of them being 21 year old longstanding records! I am the current female Senior Olympic Weightlifting champion of Ontario in 69kg class and is a four-time Ontario Junior Champion and held the title of 2014 Senior Champion in Canada in the 75kg class. 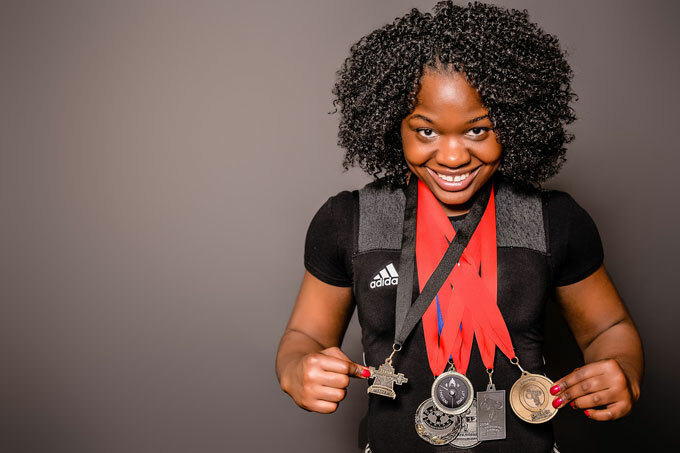 As a part of the Canadian Junior Weightlifting team, I competed in both the 2014 and 2015 World Junior Championships, held in Kazan, Russia and Wroclaw, Poland respectively. After disappointing results in Russia, I put forward a valiant effort in Poland and placed 5th in the world. Although I did not compete, I was listed as an alternate in the 2015 Pan American Games held in Ontario, Canada. I have dreams of making Canada proud on the world stage by bringing home a gold medal. As a disciplined and driven athlete, I have become an example to young girls everywhere – showing them that hard work and determination can make dreams come true.